Location of Cokeburg in Washington County, Pennsylvania. 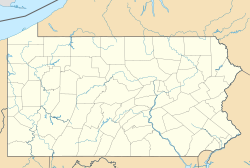 Cokeburg is a borough in Washington County, Pennsylvania, United States and part of the Pittsburgh metropolitan area since 1950. Founded in 1902, the population was 630 at the 2000 census. Cokeburg is located at 40°6′0″N 80°3′49″W﻿ / ﻿40.10000°N 80.06361°W﻿ / 40.10000; -80.06361 (40.100120, -80.063637). According to the United States Census Bureau, the borough has a total area of 0.4 square miles (1.0 km2), all of it land. Cokeburg is drained by Pigeon Creek. The borough is crossed by Pennsylvania Route 917. As of the census of 2000, there were 705 people, 308 households, and 206 families residing in the borough. The population density was 1,931.0 people per square mile (735.7/km²). There were 339 housing units at an average density of 928.5 per square mile (353.8/km²). The racial makeup of the borough was 98.87% White, 0.14% Asian, and 0.99% from two or more races. There were 308 households out of which 26.9% had children under the age of 18 living with them, 50.6% were married couples living together, 13.3% had a female householder with no husband present, and 33.1% were non-families. 31.2% of all households were made up of individuals and 19.2% had someone living alone who was 65 years of age or older. The average household size was 2.29 and the average family size was 2.85. In the borough the population was spread out with 21.0% under the age of 18, 6.8% from 18 to 24, 27.0% from 25 to 44, 23.5% from 45 to 64, and 21.7% who were 65 years of age or older. The median age was 42 years. For every 100 females, there were 85.0 males. For every 100 females age 18 and over, there were 81.4 males. The median income for a household in the borough was $30,179, and the median income for a family was $39,028. Males had a median income of $32,404 versus $19,514 for females. The per capita income for the borough was $15,754. About 6.9% of families and 9.9% of the population were below the poverty line, including 14.9% of those under age 18 and 13.2% of those age 65 or over. The last episode of the TV series Quantum Leap, starring Scott Bakula and airing on May 4, 1993 on NBC, was filmed in Cokeburg, where it portrayed the "final leap". The site was chosen because it was the childhood home of the show's creator, Donald P. Bellisario. ^ VanDerWerff, Todd (July 6, 2010). "Donald P. Bellisario". Los Angeles Times. Retrieved 15 June 2015.